High in the Rocky Mountains along the British Columbia-Alberta divide, John Pomeroy is seeing signs of the changing climate that has brought a crippling drought to the U.S. West. The director of the Centre for Hydrology at the University of Saskatchewan monitors 35 remote observatories in the mountains from Kananaskis, west of Calgary, to the Athabasca glacier, 100 kilometres south of Jasper. And the data he is collecting – which show snowpacks vanishing at record speed – point to dramatically reduced river flows across B.C., Alberta and Saskatchewan this spring. With recent record dry spells in some areas, the shortage of runoff water could lead to drought across a vast region of Western Canada. "We're not there yet," he said, when asked if it could get as bad as the disastrous U.S. situation, which this year is expected to cause agricultural losses of $3-billion in California, $1.2-billion in Washington and an unknown amount in Oregon. But there is reason to worry, he added, because the conditions are linked to climate change and appear to be here for the long term. This year, the Rocky Mountain snowpacks, which usually melt slowly, releasing water well into the summer, have had "a dramatic decline." This past winter, those snowpacks were as low as 25 per cent of normal measurements, and they vanished quickly in the spring. "All our stations are free of snow now, which is the earliest we've seen it," Dr. Pomeroy said. "Not only was the maximum of snow water available quite low, but the snow melted much earlier – about a month to a month and a half earlier than what we would expect." He said the conditions are "eerily like" what he has projected will occur if a global warming of two degrees occurs, which climate-change scenarios consider likely. "The relatively warm winter and spring in B.C. 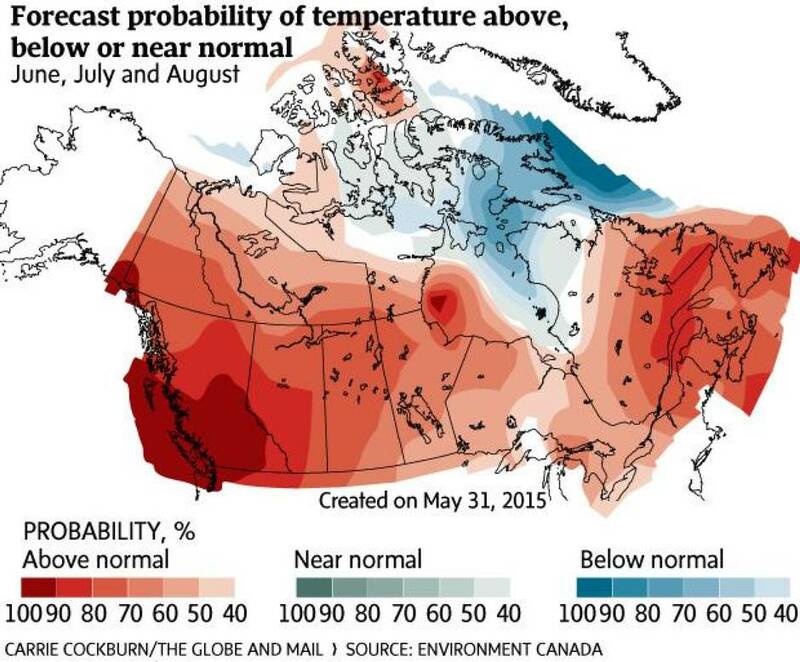 and Alberta this year has shown … what a future winter will look like," Dr. Pomeroy said. "There was record dry in Saskatchewan in May, and so that's quite bad," he said. "It doesn't take that long for [the soil to dry out] and then the prairies start to call it a drought and … I'm sure some farmers are already in trouble." Dr. Pomeroy said the vanishing snowpacks in the Rockies are part of a pattern of extreme weather. The drought in the U.S. West, floods last month in Texas and torrential downpours last summer that caused flooding in Saskatchewan and Manitoba are related. "There is a link between these [events].What's happening is weather systems are stalling over areas for longer periods than normal," he said. "We've looked at trends across the prairie provinces for the lengths of storms over the last century, and we've found that the storms are getting longer and longer and each individual storm carries more and more rainfall. So that's associated with these fronts taking longer to pass through. The other side of that is if it's a hot, dry air mass, and it stalls, we end up with a drought." The decline of winter snow has been felt beyond the Rockies in mountain ranges across B.C. The B.C. River Forecast Centre reported that by June 1, little snow remained and late summer conditions were prevalent even at high elevations. Last week, the town of Osoyoos began water restrictions because of concerns about the potential for drought in the South Okanagan. And on Vancouver Island, alarms are being raised about extreme low water levels in the Cowichan River. "We pretty much set a record this year [for early snow melt]," said Rodger Hunter, co-ordinator of the Cowichan Watershed Board. He said the Cowichan was running at levels not usually seen until August. "It's drought," Mr. Hunter said. "Some years, you get snow melt right into July, and this year, it just isn't [present] and there have been low flows." The drought is much further advanced south of the border, where California has struggled with a water shortage for four years. Washington Governor Jay Inslee recently declared a statewide drought emergency. "We're really starting to feel the pain from this snowpack drought," he said in a statement. "Difficult decisions are being made about what crops get priority water and how best to save fish." Severe drought exists in 15 of Oregon's 36 counties. In declaring an emergency this spring, Governor Kate Brown said, "the continuing dry conditions, low snowpack and lack of precipitation have caused natural and economic disaster conditions."